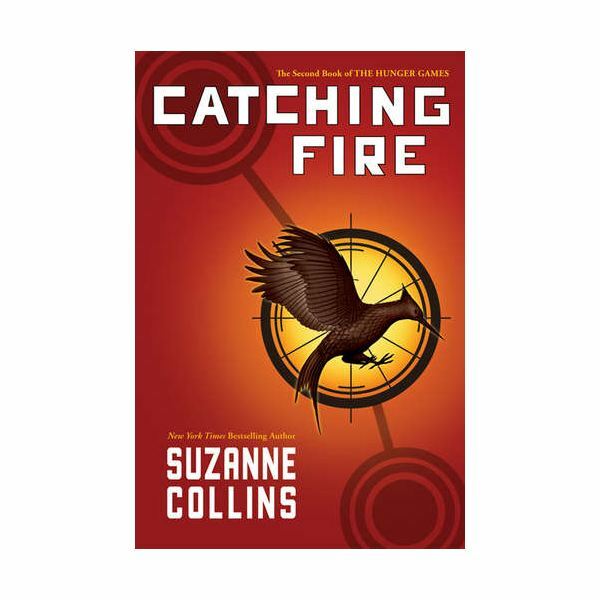 Catching Fire by Suzanne Collins tells the story of Katniss and Peeta’s return to their district after being the first ever two victors of the Hunger Games. They both realize the Capitol officials and President Snow will not be pleased that they defied the all-powerful government and started feelings of rebellion in other districts. On their victory tour, Katniss and Peeta see a man executed for his slightly rebellious behavior during their victory speeches. Katniss hears of other districts’ uprisings when she is at the mayor’s house. She wants to plan one for district 12 with Peeta and Haymitch’s help, but Haymitch just laughs at her. Katniss must still pretend to be in love with Peeta to save her family although her feelings for Gale are growing. Soon after the victory tour, the rules for the 75th annual Hunger Games, “the Quell,” have been changed, and tributes can only be chosen from previous years’ victors. This means Katniss and Peeta are going back to the arena. After training and several meetings with Haymitch, they enter a Hunger Games arena like no other. Katniss and Peeta soon find allies among some of the other tributes, and they begin working together to survive. In the end of Catching Fire, just when Katniss thinks it is over for her, the arena is blasted apart. She and a few other tributes are saved, and she soon learns from Haymitch that there has already been a plan in action for an uprising against the Capitol. Katniss Everdeen (main character): The story is told from Katniss’s point of view. She is a victor of the 74th Hunger Games, and she is the District 12 female tribute in the 75th Hunger Games. Peeta Mellark: He is the son of a baker, a victor of the 74th Hunger Games, and the District 12 male tribute in the 75th Hunger Games. He is also in love with Katniss. Gale: Katniss’s long-time friend and hunting partner. At the beginning of Catching Fire by Suzanne Collins, it is evident that the two of them feel more than friendship for each other. President Snow: The president of all the districts — he is evil and corrupt. He threatens Katniss’s family because of her actions during last year’s Hunger Games. Haymitch: He is the alcoholic mentor for Katniss and Peeta. He was also the victor of the 50th Hunger Games. Cinna: He is the brilliant designer of Katniss’s outifts whenever she is a tribute in the games. He becomes one of her friends and strongest allies, which puts him in danger. Finnick: A twenty-four year old man who was a victor of the Hunger Games ten years earlier. He becomes a strong ally of Katniss and Peeta when they are in the arena. Johanna: She is also a former victor, who is somewhat cruel and sarcastic, and becomes an ally of Finnick, Peeta, and Katniss. Discuss themes, questions, and quotes during class. Students can also write about these topics in their reading response journals. Put the names of the main characters in a bowl. Each student should pick one of the characters from Catching Fire. In their reading response journals, students should write about the 75th annual Hunger Games from that character’s point of view. For example, if a student chooses Katniss, then the student would write about participating in the Hunger Games. If a student chooses Cinna, the student would write about how he chose to defy the Capitol with Katniss’s outfit and what happened to him right before the Quell started. Once students are finished with their descriptions, they should divide into groups, so each group has one of each character mentioned on page one of this teaching guide for The Hunger Games sequel. Students read the descriptions to each other and discuss whether they have stayed true to character. Students who are creative and like an artistic challenge can design outfits for Katniss’s and Peeta’s return to the arena. Set up a debate in your classroom about issues in the book. Students should choose which side of the issue they actually agree with and come up with arguments and counter-arguments for this topic. Some possible debate topics for Catching Fire are: Should Haymitch have told Katniss about the rebellion plans? Should Katniss choose Peeta or Gale? Should Katniss and Peeta trust Finnick? (This one about trusting Finnick would need to be debated BEFORE students read the end of the book.) When students are debating these topics, their arguments need to be supported by events that happened in either the first or second book of series. This series has articles designed to go with teaching the novel, Catching Fire by Suzanne Collins, which is book two of The Hunger Games series.